No, we didn’t build this house in Lakeshore – but I do like it. On our way back from preaching in Alabama last week, we stopped by the Rural Studio. This is what happens when rednecks go to art school. 🙂 The design-build architecture lab of Auburn University, Inspired by the acclaimed Samuel Mockbee, seeks to promote socially responsible, rurally contextual, and innovatively creative design. 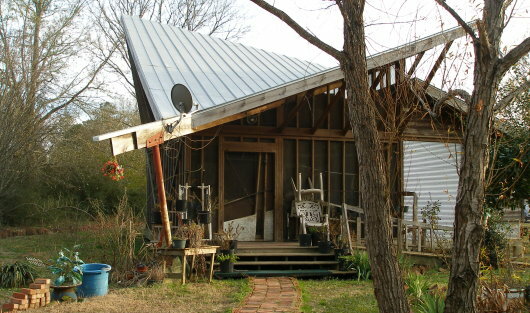 Often quirky, the architecture draws from the cultural milieu of the rural South. I particularly love their experimentation with reclaimed and repurposed materials. ‘Love your neighbor as yourself.’ This is the most important thing because nothing else matters. In doing so, an architect will act on a foundation of decency which can be built upon. Go above and beyond the call of a ‘smoothly functioning conscience’; help those who aren’t likely to help you in return, and do so even if nobody is watching! Check out the Rural Studio web site. For more pictures, video, and articles see the great piece in Speaking of Faith – Architecture of Decency. Read a few good informative articles – “Samuel Mockbee: A Life’s Work” in The Architectural Record, “Samuel Mockbee: Southern Genius” in Architecture Weekly, and “The New Rural Studio” in ARCHITECT Magazine.. I also have a couple of Rural Studio books on my Amazon wishlist. Great adjectives: responsible, contextual, and creative. Like Lakeshore Baptist Church, experimentation with reclaimed and repurposed materials. Great words: Responsible, Contextual, Innovative. Like Lakeshore Baptist Church – experimentation with reclaimed and repurposed materials.